I love the unique style of Basic Grey paper and the Urban Couture collection is one of my all time favourite ranges. The trouble is, I like looking at it so much that I never end up using it. So I finally bit the bullet and created a layout that not only shows of my photos but also the beauty of the papers. What do you think? 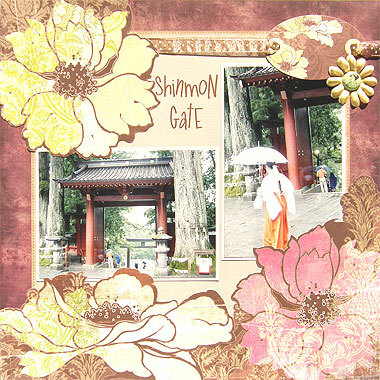 This layout was created using Basic Grey Lux paper from the Basic Grey Urban Lux Paper Pack, Karen Foster Plum Texture paper, light brown textured cardstock, light brown cardstock, brown ink, a brown pen, brown ribbon, a yellow flower, one medium sized brad (I have used a Japanese lady brad from Prima), brown alphabet rub-ons and Basic Grey Urban Couture Tag Cut-Outs. 1. Use the Karen Foster Plum Texture paper as your background. 2. Cut a piece of light brown textured cardstock measuring approximately 25.5cm by 28cm. Ink the edges with brown ink. When dry, draw dots as a border around the edges. Keep in mind that large sections will later be covered over so save time by not drawing dots all the way around. Glue to your background so that it is centred horizontally and up against the bottom edge. 3. Take a 4×6 horizontal photo and crop it so that it is only about 14cm wide. Mat with light brown cardstock and adhere on top of your textured brown cardstock approximately 0.4cm from the left edge and 8cm from the bottom edge. 4. Take a 4×6 vertical photo and crop it so that it is only about 9.4cm wide. Mat with light brown cardstock and adhere on top of your textured brown cardstock approximately 0.4cm from the right edge and 9.8cm from the bottom edge. Keep in the mind that the bottom right corner of this photo will be covered. 5. Cut out the red flower from your Basic Grey Lux paper. Make sure you keep some of the ornate detail around it as well as the straight edge along the bottom and p the right side. The piece I cut is about 16.5cm tall and 18.5cm wide. Once cut, glue in the bottom right corner of your page so that it is up against the edges and overlaps your vertical photo. 6. Cut out the green flower from your Basic Grey Lux paper. You need to turn this flower into a corner piece for the bottom left corner, as shown above. Work out where you want your horizontal and vertical edges to be before you start cutting. Again, make sure you leave some of the surrounding details in and be careful not to cut too closely to your yellow flower (you will want that soon). Glue in the bottom left corner of your page so that it is up against the edges and overlaps both your horizontal photo and part of your red flower piece. 7. Cut out the oval Lux tag from Basic Grey Urban Couture Tag Cut-Outs (the one that matches your paper). Cut a piece of brown ribbon to reach across the top of your page and thread your tag onto it, as shown above. Position the tag near the top right corner of your vertical photo so that the ribbon runs horizontally across the top of your page approximately 0.5cm below the top edge of your textured cardstock. Glue down. 8. Place a yellow flower towards the bottom right of your oval tag and secure in place with a brad, as shown above. 9. Cut out the yellow flower from your Basic Grey Lux paper. You need to turn this flower into a corner piece for the top left corner, as shown above. Again, work out where you want your horizontal and vertical edges to be before you start cutting and leave some of the surrounding details in. 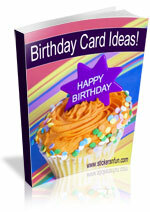 Glue in the top left corner of your page so that it is up against the edges and overlaps both your horizontal photo and your ribbon. 10. Finally, use brown alphabet rub-ons (or stickers or stamps) to add your title in the space between your yellow flower and your vertical photo. What do you think? Do you like this scrapbooking idea with Basic Grey paper? Do you have any questions? Would you have done anything different? We’d love to hear from you! Please leave a comment below. This entry was posted on Thursday, September 25th, 2008 at 9:27 pm	and is filed under Flowers, Flowers, Using Scrapbooking Papers, Vacation. You can follow any responses to this entry through the RSS 2.0 feed. You can leave a response, or trackback from your own site. Your Lay Out is amazing. no one would ever know that you had an injury from the look of this. I just hope it hasn’t caused so much pain that you won’t be able to create again for ages. All the best for the healing. You must be having some big withdrawal pains but this surely made it feel better. A fantastic LO and like you just love Basic grey papers. Thanks Bev & Jeanette. I’m so glad you like this page. I had so much fun with it and yes, I had been suffering some severe withdrawal pains. Thankfully, I’m getting back into my creative groove though. Look out for lots more pages soon.